There are many Chemical grades and it is important to understand the grades of the chemicals you are buying or are available. 1. A.C.S. - A chemical grade of highest purity and meets or exceeds purity standards set by American Chemical Society (ACS). 2. Reagent - High purity generally equal to A.C.S. grade and suitable for use in many laboratory and analytical applications. 3. U.S.P. - A chemical grade of sufficient purity to meet or exceed requirements of the U.S. Pharmacopeia (USP); acceptable for food, drug, or medicinal use; may be used for most laboratory purposes. 4. N.F. - A grade of sufficient purity to meet or exceed requirements of the National Formulary (NF). 5. Lab - A chemical grade of relatively high quality with exact levels of impurities unknown; usually pure enough for educational applications. Not pure enough to be offered for food, drug, or medicinal use of any kind. 6. Purified - Also called chemically pure(C.P.) or practical grade(P.A. ), and indicates good quality chemicals meeting no official standard; can be used in most cases for educational applications. Not pure enough to be offered for food, drug, or medicinal use of any kind. 7. Technical - Good quality chemical grade used for commercial and industrial purposes. Not pure enough to be offered for food, drug, or medicinal use of any kind. These are some other standards you might encounter. B.P.- Chemicals manufactured under current Good Manufacturing Practices (BP) meets British Pharmacopeia. E.P. - Chemicals manufactured under current Good Manufacturing Practices (EP) meets European Pharmacopeia. HPLC - manufactured specifically for use with HPLC instruments. 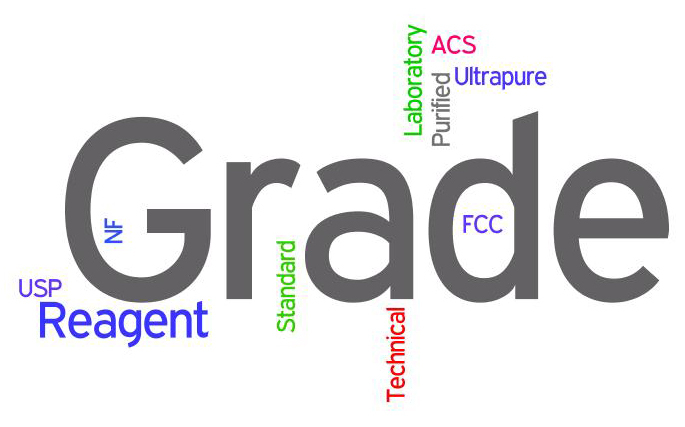 Grade meets all ACS specifications. Submicron filtered. HPLC and spectrophotometry procedures Available on request Pesticide Solvents for use in analysis of pesticide residue. Pesticide grade meets or exceeds ACS standards of purity for pesticide residue analysis. GC with electron capture detector (ECD). J.P. - Chemicals manufactured under current Good Manufacturing Practices (JP) meets Japanese Pharmacopoeia. N.F. - Chemicals manufactured under current Good Manufacturing Practices (cGMP) and meeting the requirements of the National Formulary. OPTIMA - Acids and solvents of extremely high purity. Acids are analyzed for 72 metals by ICP/MS; impurity levels in ppt. Solvent impurity levels in ppm. UV absorbance curves and sample chromatograms available on request. HPLC, GC, plasma/ICP, spectrophotometry, and pesticide residue analysis. OR - Organic reagents that are suitable for research applications. Reagent ACS - Reagents meeting the requirements of the American Chemical Society Committee on Analytical Reagents. The specifications are based on the ACS Reagent Chemicals Ninth Edition. Reagent ACS Primary Standard - An analytical reagent of exceptional purity that is specially manufactured for standardizing volumetric solutions and preparing reference standards. ReagentPlus - Products of extra purity for use in chemical analysis & research applications. Spectranalyzed - Solvents for use in spectrophotometry. Grade meets all ACS specifications. Actual lot analysis is printed on label. Available on request Available on request Biotechnology Solvents and reagents that have been specially purified and assayed for biotechnology applications. Electrophoresis, molecular biology, sequencing, and peptide and oligonucleotide synthesis. U.S.P. - Chemicals manufactured under current Good Manufacturing Practices (cGMP) and which meet the requirements of the US Pharmacopeia.